A home health agency depends on its entire care team—aides, nurses, therapists, and social workers—to ensure proper care and documentation. If the team doesn’t understand ethics and liability, the agency is in danger of fraud, abuse, Medicare reimbursement denials, and legal issues. HCPro’s new Ethics and Liability for the Home Health Team video provides agencies with standardized staff training that can be used to train an entire staff at once or individual staff members at the point of hire. The video addresses all members of the care team, providing common and challenging scenarios often faced by home health staff. In order to confirm the training’s effectiveness, this video includes a downloadable quiz that your agency can keep on file. 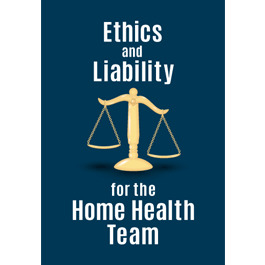 Including Ethics and Liability for the Home Health Team in your training program will give your staff consistent, effective training and help your agency avoid falling victim to negative consequences. Mary Ellen Conway, RN, BSN, is a nurse healthcare consultant with over 25 years’ expertise in management throughout the healthcare continuum. As the president of Capital Healthcare Group, she is known for her special expertise in operations and regulatory compliance issues in the post-acute arena, including home health, hospice and medical equipment, physician practice, supplemental staffing, transitional care programs, and accreditation. Conway is qualified as a legal expert in home health and has served on the faculty of both Georgetown University and Catholic University’s schools of nursing. She is a nationally recognized healthcare consultant, speaker, and author. She writes for several national publications, is very active with several state and national associations, and is a member of various advisory boards.